NetSim 11 Network Simulator® for CCENT software includes technologies for the newly revised Cisco® 100-105 ICND1 exam. The 100-105 Interconnecting Cisco Networking Devices Part 1 (ICND1®) is the exam associated with the Cisco Certified Entry Network Technician (CCENT®) certification and is a first step in achieving the Cisco Certified Network Associate (CCNA®) certification. 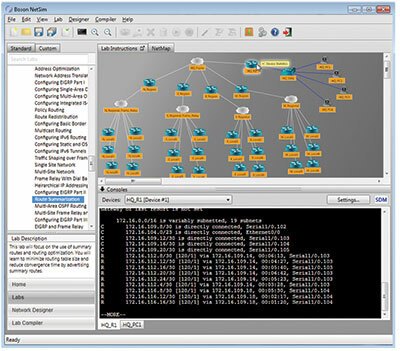 NetSim 11 for CCENT software is the most powerful and versatile Cisco network simulation product available for IT professionals seeking CCENT certification. The Boson Router Simulator® software and Boson Virtual Packet Technology® engine set NetSim apart because this technology actually simulates the network traffic of a real network in a simulated network that you can design yourself. NetSim 11 minimum requirements – NetSim requires one of the following Operating Systems: Windows 8, Windows 7, Windows Vista or Windows XP. NetSim 12 is coming soon. Anyone who purchases a NetSim 11 product on/after September 26, 2018, will qualify for a free upgrade to the new corresponding NetSim 12 product when it is released. Qualifying customers will be sent an upgrade notification via email when NetSim 12 is available. The NetSim 11 for CCENT product contains ICND1 CCENT-specific lab exercises that cover the skill set you will need to prepare for your 100-101 and 100-105 ICND1 CCENT exams. I bought this Net-sim and was planning to upgrade to the CCNA tier after I passed ICND1, but was then informed that you have to buy the highest tier and can't separately unlock the ICND2 labs with their software... Please beware! The software itself it great though. I am thoroughly impressed with this simulation. The instruction are clear and well written. I haven't ran into any application errors either. Get this lab if you are looking for hands on experience. These Labs are just just fun but makes it easier to take in for exam. Also much better then class learning where instructors run through course work. I believe this was beneficial to me passing the test.